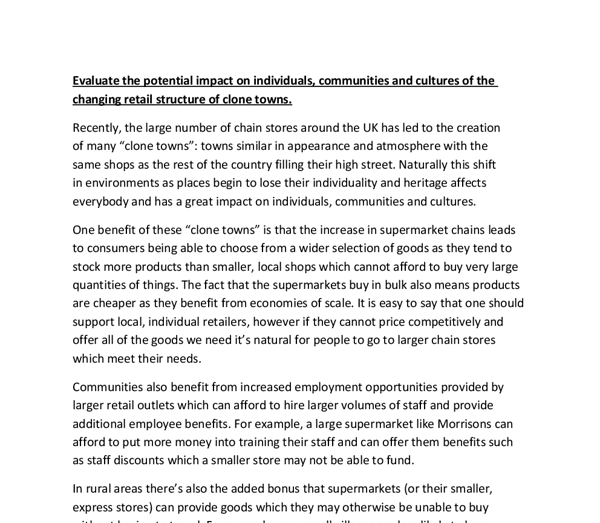 ﻿Evaluate the potential impact on individuals, communities and cultures of the changing retail structure of clone towns. Recently, the large number of chain stores around the UK has led to the creation of many ?clone towns? : towns similar in appearance and atmosphere with the same shops as the rest of the country filling their high street. Naturally this shift in environments as places begin to lose their individuality and heritage affects everybody and has a great impact on individuals, communities and cultures. One benefit of these ?clone towns? is that the increase in supermarket chains leads to consumers being able to choose from a wider selection of goods as they tend to stock more products than smaller, local shops which cannot afford to buy very large quantities of things. The fact that the supermarkets buy in bulk also means products are cheaper as they benefit from economies of scale. ...read more. The history, monuments, landscape, and local dialect will remain unchanged and they are the true things which define an area. Local produce is still sold in supermarkets and ultimately it is a case of quality and personal preference. If people prefer the lamb from their local butcher?s as opposed to the pre-packaged supermarket?s offerings then they can still choose to buy what they want. Attitudes have changed over the generations and if communities are not particularly tight-knit and members do not feel as if they should be compelled to support local businesses then they will make choices based on the services that different shops can provide. On the other hand, there are a number of disadvantages of these clone towns. Primarily there is the fear that small villages will lose part of their culture and heritage. Regional diversity makes places interesting therefore if all of the UK becomes the same places will lose their individuality and the things which make them special. ...read more. If a large store also chooses to leave a small town it can leave members of the community without a place to shop for necessary items and lacking key amenities. In addition, the architecture and elements of the appearance of a town can be lost. Large chains focus greatly on branding with many of their stores having a uniform look which may often not fit the style of the rest of the buildings in a place and can sometimes be an eyesore and take away from the individuality of a place. In conclusion, the changing structure of retail towns is contributing towards a loss of identity however there are many benefits of the arrival of many chain stores to these areas and it?s very difficult to satisfy everyone by keeping all of the local culture and still having cheap, convenient goods available. Despite the change in character of a town being perceived as entirely a bad thing by many, it can lead to some areas being redeveloped and improvements being made, whilst other more historic areas still remain intact. ...read more. 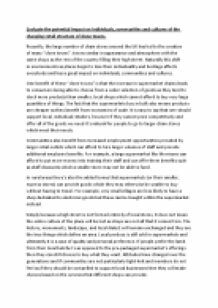 This is a well written essay evaluating the positives and negatives of clone towns. To improve this essay should include more specific examples, and possibly some images, to demonstrate the points being made. In the "real world", the economies of the world are not separate in the way described by Hardin. Nations have an effect upon each others food supply, population size, economic growth, political systems and more. The effect of rich nations upon poorer ones is undoubtable, and it has not always been beneficial or even well-intentioned. There nightlife is lively and colorful, with a string of bars and restaurants. Other attractions include zoos and water parks, casinos, bullfights and amusement parks. The coast is often nicknamed "The Costa del Golf," for it boasts one of the highest representations of first class golf courses. However, there are severe limitations when looking at countries outside of these regions; the timescale of the model, especially in several South-east Asian countries such as Hong Kong and Malaysia, is being squashed as they develop at a much faster rate than did the early industrialised countries, therefore making the time scale, and consequently the utility of the DTM obsolete. A factor that may drive the young people on is the fact that they are where they are because of the efforts of the adults of the previous generation. This can help them gain a sense of perspective and appreciate and respect the adults. It aims to encourage investment to boost local economies. Key players: * Local Councils e.g. Cornwall and Isles of Scilly Council) * Development agencies e.g. the South West Development Agency - who use government money to stimulate and to regenerate the economy * Central government and its agencies e.g. I also did an environmental quality survey at the top and bottom of each area. I will take lots of photos while I am there. I will use both primary and secondary data and I believe that it will be quite easy to get reliable data. For example, in figure 3, which illustrates the housing, layout and design which was poor unimaginative and high density. While there was absence of open space with nowhere the children could go and play was a problem to the quality of life in the area. Most people came from the central and southern regions as can be seen from the diagram below, with the majority living close to the city. The migration had the effect in helping Mexico City become a mega city. Many of the migrants settled on new land outside the city centre, which initiated the growth of the city outwards.